Radical amazement for sunsets, backpacking through Israel, and the writings of A.J. Heschel and Jack Kerouac initiated a spiritual journey for Rabbi Brad Greenstein that would fuse his love of music, Torah, nature, and poetry. 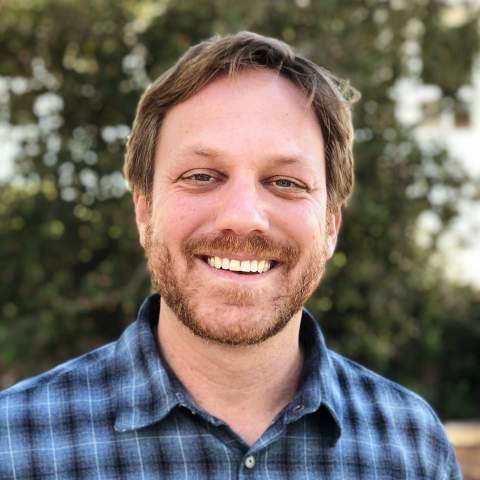 Returning to his hometown of San Diego, Brad is extremely excited to be Moishe House’s Senior Director of Jewish Learning. Brad graduated from the University of California Davis with a B.A. in literature. He earned a master’s degree in rabbinic studies and received his rabbinic ordination from the Ziegler School of Rabbinic Studies at the American Jewish University. Brad trained as a hospital chaplain, pioneered the first b’nei mitzvah project in Siberia, and served for eight years as the Associate Rabbi for a large synagogue in Portland, OR, innovating programs centered on spirituality and mindfulness. Brad loves the practices of Judaism that give voice to the beauty of nature, the mystery of the universe, and the connection of our souls. He also loves live music and oatmeal chocolate chip cookies. Rabbi Brad and his wife Sarah, a licensed clinical social worker, live in North County San Diego and love going to the beach with their three little girls.